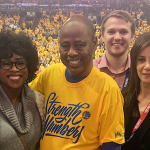 Cleveland, OH – Cleveland Cavaliers fan James McCants was particularly excited for Game 3 of the NBA Finals 2018 presented by YouTube TV last night. 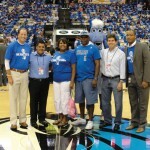 Mr. McCants was named “Designated Driver for the Season” for the Cavs and attended Game 3 as a grand prize winner of the “Responsibility Has Its Rewards” sweepstakes. 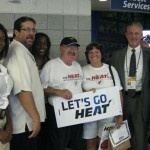 Veronica Thomas was named “Designated Driver for the Season” for the Golden State Warriors and attended Game 1 of the NBA Finals as the other grand prize winner of the sweepstakes. Both winners were randomly selected among all fans who pledged to be designated drivers at Cavaliers and Warriors home games. Designated drivers pledge to refrain from drinking alcohol and provide their friends and family with a safe ride home. 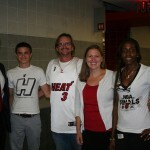 Throughout the season, the NBA, Techniques for Effective Alcohol Management (TEAM) Coalition, Budweiser and NBA teams across the country worked together to make more fans aware of the designated driver programs at NBA arenas, encourage responsible drinking, positive fan behavior and promote traffic safety. The success of those efforts is demonstrated by the fact that a record number of NBA fans – 74,432 responsible adults, to be exact – pledged to be designated drivers during the 2017-2018 NBA season. TEAM Coalition is an alliance of professional and collegiate sports, entertainment facilities, concessionaires, stadium service providers, the beer industry, distillers, broadcasters, traffic safety experts and others working together to promote responsible drinking and positive fan behavior at sports and entertainment facilities. TEAM Coalition members and supporters include the National Basketball Association, Anheuser-Busch Companies, Aramark, Major League Baseball, Major League Soccer, NASCAR, National Football League, National Hockey League, National Collegiate Athletic Association, Americrown, Delaware North Sportservice, Legends, Spectra, Beer Institute, National Beer Wholesalers Association, Constellation Brands, HEINEKEN USA, MillerCoors, Brown-Forman, Live Nation, National Association of Broadcasters, Contemporary Services Corporation, International Association of Venue Managers, Stadium Managers Association and the National Highway Traffic Safety Administration. For more information visit TEAMCoalition.org or FansDontLetFansDriveDrunk.org.